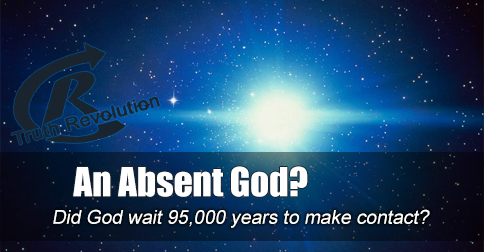 Did God wait for thousands of years before making contact with humans? [audio:http://www.truthrevolution.tv/show/TS-0327.mp3]No Flash Support? Use this Audio Player! Jeff: If we accept what the Bible suggests was the beginning of humanity, then, no God didn’t stay silent for the first 95,000 years. Dave: God was there with Adam and Eve between 100,000 and 200,000 years ago. Jeff: And it’s not as though God left humanity all alone; we chose to reject him. Jeff: And we should note, that Biblical records indicate that all this while humankind could communicate directly with God. Dave: But nations eventually went their own way, abandoning God. Jeff: There was no 95,000 years of silence! It was God and humans together, until humans walked away from God. Dave: And God did choose to use one nation, but it was to bring news the whole world, not exclude the rest of the world.